The SharePoint 2010 MP is one of the most difficult MPs to troubleshoot. From the surface it appears it have some magical configuration file and configuration tasks. But if you drill down into the nuts and bolts of the MP it’s really not magical at all. After a while I notice that I am getting the following error in the Operations Manager event log on my SharePoint server. Cannot identify which SharePoint farm this server is associated with. Check the management pack guide for troubleshooting information. I tried tweaking the SharePointMP.config file a few dozen times. But it didn’t fix the problem. I start thinking this MP can’t be all that magical and I start to dissect the MP. Frist I export all the MPs to XML using my MP2XML Pro tool. After I review the PowerShell Script I conclude it only does three basic things. - First it creates a Overrides MP called Microsoft.SharePoint.Foundation.2010.Override.xml. I open up the Override MP and find out all it does is enable discovery and sets the interval and sync time for the discoveries. I know that this is not my issue so I move on. Not so complex. I could have did this manually. Ok so this one seems to be a little more magical! I can seem to create these from the console, as the Association is System. But I probably could have just created the associations the normal way. Not worth spending anymore time on this as I know its correct. So now what? I have everything setup correctly but my SharePoint server still shows up as Unidentified! I go back to the event log that I seen earlier. What is causing this? After a few searches I don’t find anything useful. I know the alert is generated by the MP so lets search my exported MPs to see why it’s getting generated. I open up the text file and search for the “Cannot identify which SharePoint farm this server is associated with. Check the management pack guide for troubleshooting information”. I discovery the text is thrown by a PowerShell script when the variable $global:EventLog_Fail_Identify_Farm I called. I discover that the error will be thrown if variable $global:Farm is equal to null. Lets see what Get-Farm does. I log into my SharePoint Server. 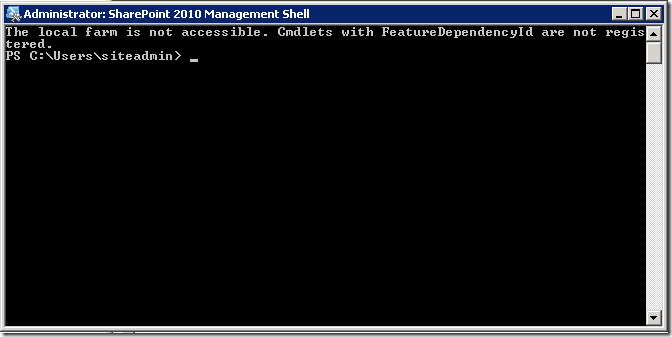 I launch the the SharePoint 2012 Management Shell and I get this error. SharePoint Scripts are not working at all on my SharePoint server! The problem has nothing to do with SCOM. It’s a SharePoint issue. Just like that all my servers get discovered and everything starts to work! If I find any of theses other errors in the future, now I know the process to troubleshoot it.